NASHVILLE , Tenn. (AP) - The notion that something has gone wrong with country music got heavyweight support this weekend from Johnny Cash and Emmylou Harris. Both were honored Friday night at the Americana Awards Show, and each made it clear they feel more at home on the margins of the industry - where they feel its real heart is. The Americana Music Association's first awards show promoted a rawer, less flashy version of country than the music of Shania Twain and other mainstream Nashville stars. ``There might not be millions and millions of people out there who understand it, but there are people out there who hunger for something more,'' Harris said as she accepted a lifetime achievement award. The highlight of the night was a rare appearance by the 70-year-old Cash, who has had health setbacks in recent years including diabetes and bouts of pneumonia and bronchitis. Cash recited a patriotic poem, ``That Ragged Old Flag,'' and performed with his wife, June Carter Cash. At first frail, he seemed to gain strength from performing again. 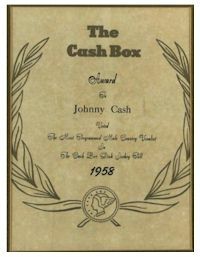 ``Thank you very much, folks,'' Cash said during one of three long standing ovations. Activism, not music, earns a country legend honors on this night Heralded for the social activism and humanity within so many of his genre-altering, culture-quaking songs, Country Music Hall of Famer Johnny Cash walked to a microphone last night at downtown Nashville 's Hilton Suites Hotel ballroom and received the inaugural Spirit of Americana Free Speech Award. was presented by Freedom Forum First Amendment Center founder John Seigenthaler. The occasion was the fledgling Americana Music Awards Show, an event designed to celebrate the purveyors of rootsy, often-twangy music that exists outside the boundaries of the contemporary commercial country music world. But the roomful of supposed musical outsiders reserved the night's most enthusiastic reception for country stalwart Cash, 70, whose iconic artistry transcends stylistic borders. 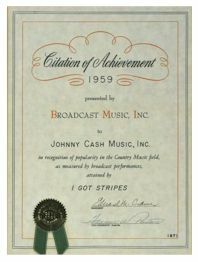 After listening to Seigenthaler praise him as ''the advocate of the poor and the powerless'' who challenged societal norms by making ''music that reminded us of what we would rather forget,'' Cash thanked the audience, then opted to forego an acceptance speech in favor of reciting an updated version of his 1974 song-poem, Ragged Old Flag. 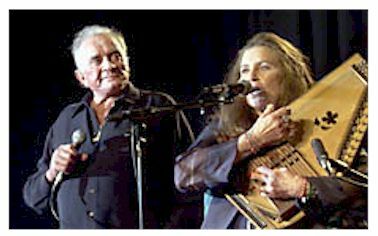 Cash's appearance — along with a two-song, show-concluding set with wife June Carter Cash and a bevy of musical relatives — was the highlight of what proved an endearing evening, a night in which music often thought ''unmarketable'' and ''difficult'' was cheered and endorsed. Singer-songwriter Jim Lauderdale took home two of the four ''yearly'' awards, for Song and Artist of the Year. His She's Looking At Me, recorded with Ralph Stanley & The Clinch Mountain Boys, earned the Song designation after voting from the 900-member Americana Music Association. Lauderdale's Artist prize likely took quantity into account along with quality: the North Carolina-born, Nashville-based performer's past annum included two new albums, a heavy touring schedule and a critically acclaimed stint in a play about Tammy Wynette (he starred in the role of George Jones). While the 3-year-old Americana organization has spent much time and effort attempting to define a nebulous ''style'' of music, the awards show chose to rejoice rather than classify. Husband and wife team Buddy & Julie Miller won the Best Album trophy for a self-titled album that used folk, country, rock and pop sounds capes. The evening's other yearly prize went to Jerry Douglas, named best instrumentalist for his Dobro work. Besides Cash's citation, four Lifetime Achievement Awards were handed out. O Brother, Where Art Thou? 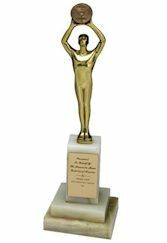 producer T Bone Burnett won for Lifetime Executive, legendary songsmith and performer Billy Joe Shaver was named Lifetime Songwriter, departed Texan Doug Sahm was named the President's Award winner and Emmylou Harris received the Lifetime Performer trophy. After the awards were handed out, June Carter Cash strode into the spotlight, with family members including daughter Carlene Carter (who has recently moved back to Nashville ), niece Lorrie Carter, granddaughter Tiffany Anastasia Lowe and, of course, husband Cash. Instrumentalist winner Douglas was hard-pressed for words to describe his reaction to the Cash/Carter confab. MTV won't say how many times the video actually aired on the network; Rubin said he's heard it was played six times — one for each video music award nomination. It has, however, gotten much more exposure than Romanek expected on outlets like CMT and MTV2. Romanek's original idea was to film Cash on a Los Angeles soundstage packed with memorabilia from the singer's career. 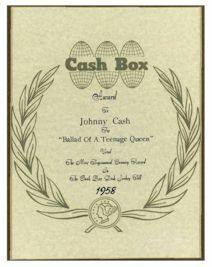 The artifacts would gradually disappear until Cash appeared alone at the song's end. Yet Cash wasn't healthy enough to make the trip, so the director brought his crew to Cash's home, not knowing what he'd find. One stroke of luck was finding the shuttered and decaying House of Cash Museum five minutes from the singer's home. 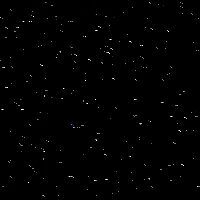 It was used in the video, too. He never expected to make such a powerful reflection on aging and mortality. The veteran producer, a pioneer in rap music who has helped Cash to a creative rebirth with a series of intimate recordings, said he's heard more people talking about the video than anything he'd ever worked on. Romanek said that as a fan, he's always appreciated the candor in Cash's music and thought the video should reflect that. Cash may have been clear-eyed when watching with Rosanne, but was quite taken aback when he first saw it, Rubin said. It was only with his family's encouragement that he agreed to release it. Now, he said, Cash is quite proud and excited that it has gotten recognition. Tom Calderone, MTV's executive vice president of music and talent, is hoping to see Cash at Thursday's awards show. He'll provide some heft for an event that even Calderone admits usually has its share of here-today-gone-tomorrow artists. Cash continues to work despite his health problems and the emotional blow of becoming a widower. He and Rubin are recording their fifth disc together, and are also preparing a box set of unreleased material from their sessions over the past decade. Romanek said he doesn't want his video confused with real life. Cash's life isn't that bleak, he said. 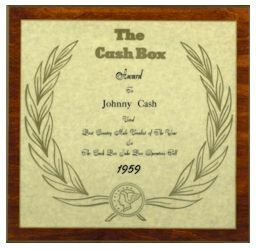 Composition with a gold plaque on a wooden base, inscription reading : Johnny Cash / A Giant Of The Country Music Industry. Presented By The Country Music Wax Museum. The Country Music Wax Museum opened on Music Row in 1971. It closed in 1997, due to the changing face of tourism in Nashville. 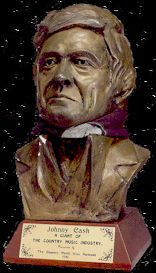 Johnny donated clothes and a guitar for his full size likeness, which was unveiled in 1981 at the museum and commemorated in this bust, a gift form the museum.